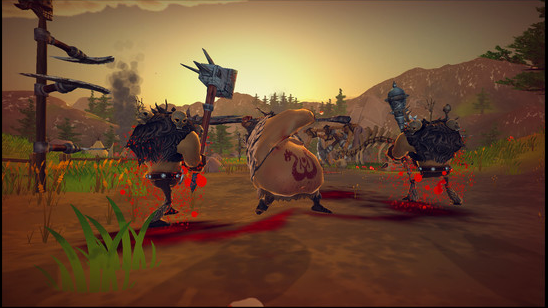 Barbarian Brawl is a third-person online deathmatch combat game that has you playing one of six barbarians in an act of mortal combat. You will battle across a single battlefield full of traps, power-ups, meat, and a purple haze (hearing that makes me want to play my Jimi Hendrix albums) and the battle won't end until a warrior wins by gaining the most amount of kills. Characters you'll be playing in this game includes: Baabaar, the classic muscle bound warrior. Crazy Eyes, a crazy looking bugger that runs around wearing animal skin. Buttercup, the buxom beauty that will have all the guys go crazy. Bryn Hildr, a woman that's fat but far from being lazy and she won't stop until she sings (hooray for bad puns). Mr. Rotten, another crazy bugger that lives up to his name. Lastly we have Klondike, a glutton for food, punishment, and raising hell. 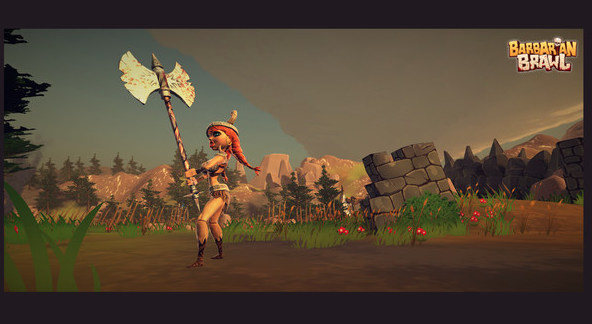 This game certainly has a basic concept but will it be too basic to enjoy? (Click on "Read More" to read the full review). If you are coming into this one expecting there to be a story, you'll be very disappointed as this game doesn't even have one. This game is a pure deathmatch arena game that has the players kill each other until the time runs out and the winner is the player with the most kills. 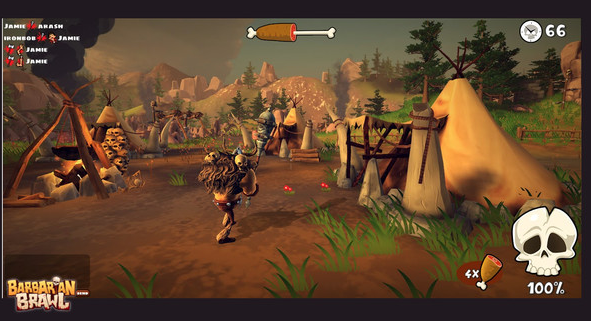 This is a game that also has a comedic cartoony style to it, so if you are familiar with games such as Fur Fighters (2000) and Team Fortress 2 (2007), you'll feel right at home with this one. This game is incredibly shallow as you only get two modes, Deathmatch, and Team Deathmatch, they aren't bad modes to have but it would've been nice to have a few more modes added as this game is incredibly light on content, it does get a bit stale playing those two modes over and over. This game is only playable online as well and there isn't much going on, it is a pretty dead multiplayer society for this game. Do not worry, the servers do make up for it by having all of the other players as computer controlled bots but the bots aren't very hard to beat, so you won't get all that much satisfaction from killing them. This game only has two servers, one for the United States, the other for the United Kingdom but they both work fine no matter what country you are playing them from. The combat itself is really basic, all you do is swing with your weapon and block with your shield or weapon (depends on the character), be careful though, you also have a pretty nasty poke attack that's hard to pull off but very satisfying to do so as it'll stun the enemy. The gameplay is so simple that it is very shallow and lacks a lot of depth and it gets boring very quickly. The hit detection is on the sloppy side as you don't get that huge oomph from landing a hit, you also don't have to directly hit your opponent, you can land a hit by hitting a small area of air around them and it hurts the fun. This game also doesn't require much strategy to win as all you'll do is swing for the best and this will get you a kill 95% of the time. The only thing you should look out for are the traps and water, they'll kill you in an instant. You can also find power-ups scattered throughout the game and they'll help boost one of your stats like making you super strong or super fast. The purple haze will cover a huge chunk of the map and what the purple haze does is similar to the power-ups, the haze can heal you up, the haze can make you temporally immortal, and the haze can even kill you on the spot. The purple haze will also change spots each time you start a new game and I liked that as the unpredictable nature of the purple haze is a very nice touch. This game will start you out with one character, Baabaar, and in order to unlock more you'll have to fulfill certain conditions and these conditions are incredibly tedious, especially since you'll have to unlock certain weapons to even fulfil the conditions in the first place. The way you unlock weapons is by spending currency and this currency is in the form of huge legs of ham and you'll get them by killing other players and by finding them on the map. Getting a kill streak will give you a multiplier and this will help give you more ham, so keep on killing if you want to get some pork on that fork. Unlocking all of the characters and weapons is pointless, none of the weapons and characters have different stats, they're only good for are looks and I do not like that at all. Another really huge problem with this game is that you only get one map and mixing that in with all of the other shallow things in this game, you get a game that you'll get tired of very, very, very quickly. On the brightside, the map isn't bad and was fun to play and had some nice humor and charm to it but this game really needs more maps to help flesh out the game. 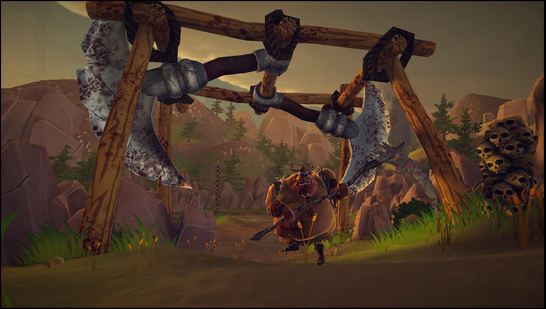 Graphics in this game have a cartoony look that suits the barbarian theme well but it is also on the dated side and looks ugly. Character designs are stiff looking and are also stereotypical to the point where most of the characters are boring. The animation is really awkward and everybody walks like they need to go to the toilet and they swing like they are drunk. Music in this game is incredibly forgettable and doesn't build up any excitement but it's not like that the music mattered in this game anyway, it is all about the action. The sound effects were mediocre and sounded really flat and doesn't give you that oomph feeling for every time you swing and hit. Overall, this is a game that had a decent idea but missed what it was trying to aim for by a whole ten miles (just think of Bulk and Skull in the intro of the Mighty Morphin Power Rangers Movie (1995)). This game really should've been free-to-play as you are not getting your moneys worth with this one at all. Avoid this one.